We have designed a technology which supports purification for more than 2,000 litres of water consumption every day without compromising on quality of water and is low of running cost. India's first Alkaline RO purification technology for industries and commercial use provides purification in a multi-stages process. This is attained by the state-of-the-art Alkaline RO combined with pH + Carbon + Sediments filter. The double filtration provided by combination of carbon and sediments filter removes both suspended and chemical impurities such as chlorin, bromine and various metal salts. The RO membrane purifies water at micro levels. Post purification alkaline filter modulates and maintains the pH level as well as minerals essential for human body. Our industrial purifier models come with great specifications yet they are extremely customizable. They are designed and configured as per the specific needs of each industry and location of usage, entirely on individual basis. The existing models are one-of-a-kind designs, made keeping in mind the need in industrial and commercial setup, maintaining top standards. Even though the purifier is for commercial use, special attention is given on its looks and ease of use. The blue and white colours and modular design with a user friendly display panel makes the purifiers one of a kind. With an advanced dozing tank system the purifiers are fully automatic in functioning and don't need any special attention. They work effortlessly on voltage fluctuations and are power efficient. It's smooth and silent rubber wheels rotate in multi-direction and easily carry the load and help in displacing the system from place to place. The front display panel is easy to use and understand and doesn't need any training to operate. 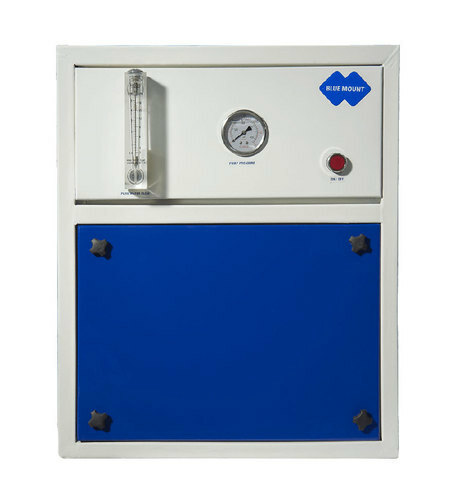 The panel indicates the quality of raw and pure water and has controls to regulate the working of the purifier. All metal parts are completely safe and corrosion resistant while the plastic parts are food grade, non-breakable ABS plastic components. This ensures that purified water remains safe and pure while in the purifier for long duration. The purifiers are not pre-loaded. They are designed and configured as per the specific needs of each industry and location of usage, entirely on individual basis. The existing models are exclusive designs and are not pre-ready models. They are manufactured as per the orders placed, thus they are never produced on large scale,maintaining top standards.